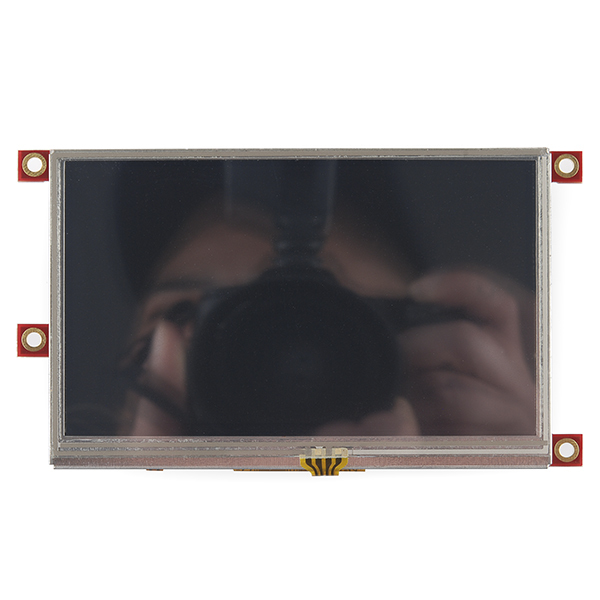 The Raspberry Pi Display Module Pack includes a uLCD-43-PT 4.3" LCD Display with Resistive Touch, a 4D Pi Adapter and 5 way interface cable. 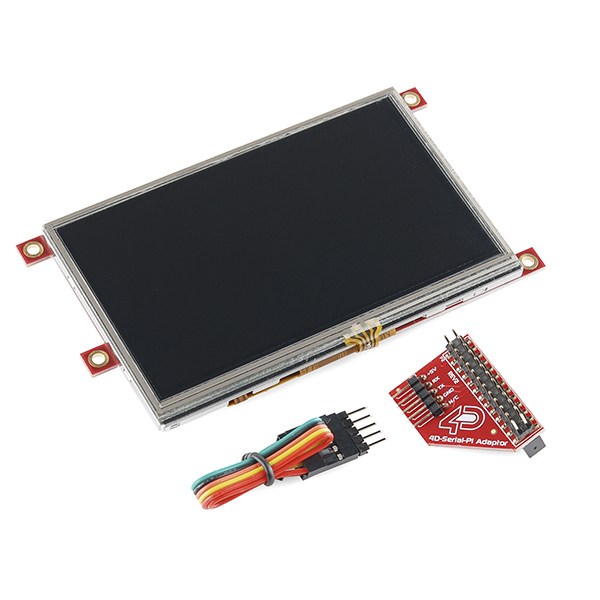 It customizes the uLCD-43-PT Display specifically for interfacing with the Raspberry Pi, to provide a quick and easy interface without any wiring hassles. I had a hard time getting the calculator demo to work. The demo project was set up for 9600 baud and I could not get communication until I set the projects baud to 115200. Is it possible to hook up two of these to one RPi? Is this using a Sharp LQ043 series display? 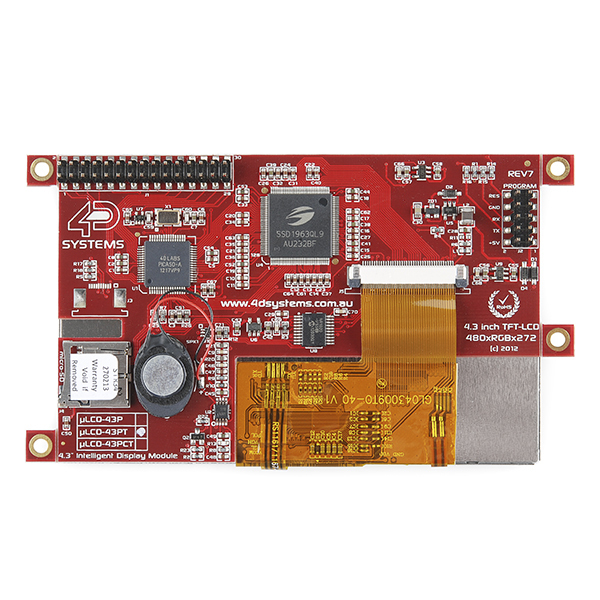 I have one that I really need a driver board for, this board would be perfect if I can get one sans the display! 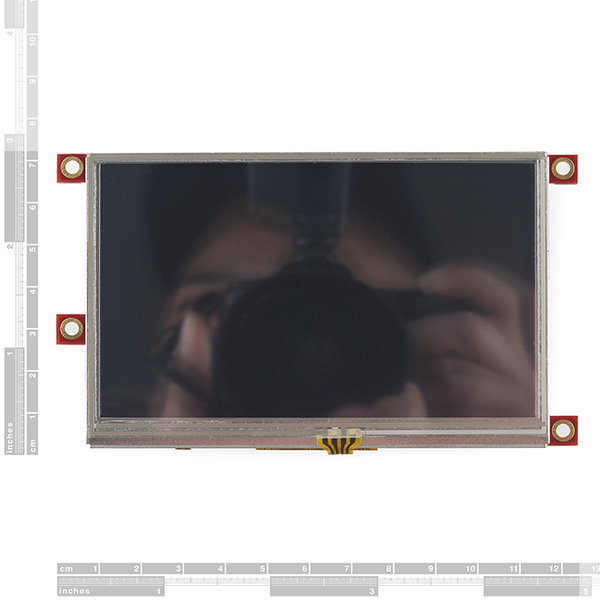 Also.. How about a nice case for a screen mounted on an arduino or RPi, making a nice project box for a "final" project?? Mouser sells the Arduino shield (971-ARDUINOADPTRSHLD) and RPi adapter (971-4DSERIALPIADPTR) separately if you need them. They are inexpensive because they only pickup power and the serial port (4 wires) ... everything else resides on the display module. The adapter shield actually holds the programming. 4D designed it that way, not Sparkfun. Take a look at the images. It even looks like it has a microSD card slot. Interesting. Brief doc says you can store multimedia on it for animations and such, or for things such as data logging. Actually, the programming is held on the board behind the screen. All the adapter shield does it break out the pins on the back to the Arduino or RPi footprint. Technically, the RPi and Arduino shield can be interchanged if you're willing to do some wiring. 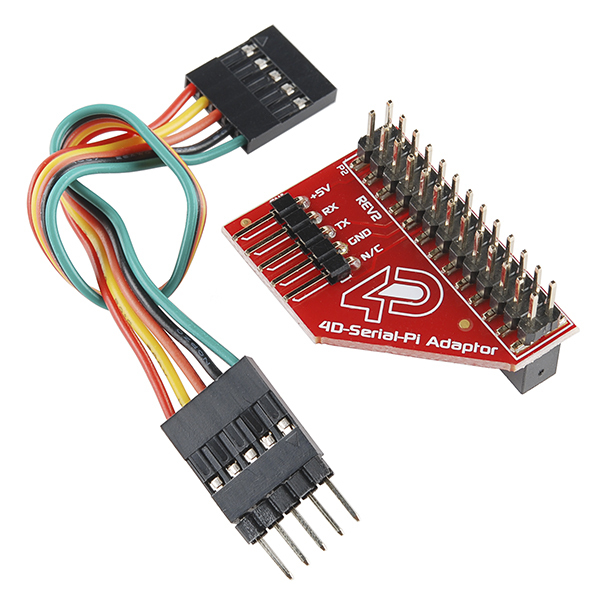 @CrazyCreator - have you seen any examples of how to rewire the RPi to Arduino Adapter. In light of Arduino Kit availability - might be a good fit. In any way does this has the ability to act as a screen for RPi, I mean shows the OS GUI? I wish someone would figure out how to do this, and write a tutorial. It could be, in a sense. You can't see the GUI, however by default, the Raspbian kernel enables command line output over the serial interface at 115200 baud. I have connected the serial lines to a BlueSmiRF silver and opened a serial terminal on my laptop, I must say it's really quite cool. I suppose you could program the screen to act as a simple serial terminal and it would work. And the reply from Sparkfun was to contact 4D Sparkfun wiping hands clean ... awesome!